Yesterday I attended a birthday party for my husband's 89 year old grandmother. It was a small gathering of family with food and drink. We were all asked to bring a dish to pass, beverages and eating utensils would be provided. As we sat down to eat I noticed that the family behind us hardly had anything on their plates. Some chips, salad, and beans. No meat. My first thought was vegetarian and I immediately wished I had brought mac 'n cheese instead of pulled pork sandwiches. Then my husband reminded me of Ramadan. Their plates weren't empty because they are vegetarian, they were empty because they are Muslim. Then I really regretted bringing the pork. The only other meat option was hot dogs. Lord only knows what those things are made of, but I am pretty sure it involves some pork. Technically Muslims are not allowed to eat or drink between dawn and sunset during Ramadan, but they were granted a travel exemption, having to make up the missed fast at a later date. Pork however is always off limits. I made a comment to my husband about wishing I had brought mac 'n cheese so they would have more to eat and he replied by saying knowing the situation they were in you think they would be prepared and bring something for themselves. That got me thinking. I often run into similar situations with my stance on sustainability. This party being one of them. My mother-in-law hosted the party and knows how I feel about plastic and disposables, yet styrofoam plates and plastic utensils abounded. She made a point to say that she would rather not use them and apologized, but should she have to? It's my belief not hers. I appreciate that she is sensitive to the issue, but should I expect her to cater to it? I did bring my own water bottle, cloth napkin, and bamboo cutlery, but left without a plate thinking the ones provided would be paper. They ended up being styrofoam. Who should I be upset with? My mother-in-law? Or, myself for not being better prepared knowing the situation I was going into? It was kind of an eye-opening moment. One that will push me to provide for myself more. It is going to be a long time before plastic and disposables become the exception. My internal lamenting and grumbling to my husband is not going to hasten the process, but if I start bringing my own reusables to family functions, get-togethers with friends, restaurants, take-out joints, basically everywhere I go, then maybe someone will take note and do the same. And then another and another and eventually society will catch on and restaurants will make the switch. But for now it is my belief not theirs. This is an excellent point, one which I am trying to do better with. People always apologize to me about their choices in either junk foods or tableware and I can't say that they really should. It's my belief, like you said, but in a way at least it gets them thinking of what they could be doing. Now if only they would. This is a situation I am in too. I can't stand waste but I have decided to be vocal about it. Whenever we go to a birthday party I bring my own plates and forks. This was embarrassing at first but now I no longer care. I figure my friends know who I am and know what I am about and if they are offended its just too bad because I will not change something about myself that I love and am proud of. The good thing that has come of all of this is my friends are now asking me eco related questions. My friend even asked me if I would take care of the dishes at the next Halloween party so she wouldn't have to use disposables. I have no problem doing this and it makes me so happy that I am rubbing off on people! This is an excellent point, and one which I think more people need to grasp. Unfortunately, we do expect people to cater to our own preferences, while not taking into account theirs. My in laws often invite me to their homes for meals. I can not attend. One reason is because I'm allergic to their animals, another is because I'm celiac and there's nothing there I can eat. They usually apologize profusely for forgetting when I politely decline and tell them why. But they don't owe me an apology, it's not their problem, it's mine. People may take notice and start to hop onto the sustainable bandwagon, but they also might not. I commend the family for not letting their faith restrictions keep them from celebrating this woman's life! That is wonderful. That's a tough one. It might be worthwhile to keep a small set of dishes in the car for times like this. 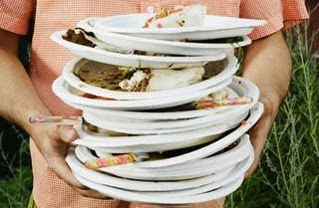 I had to reach for a paper plate in the teachers' lounge yesterday; luckily, it was paper rather than styrofoam. This exact same thing happened to us at a recent family reunion - but we weren't prepared. Everything was styrofoam and plastic, and they didn't even have any sort of recycling bag set up for cans, either. I wanted to stand up on the tables and scream about it to try and wake people up. But I took the wimpy way out and didn't say a thing. This was the first reunion for my husband's side of the family in almost 20 years (probably 75 people there). I only knew a handful of them. I just didn't want to rock the boat. The same thing happened at our family reunion this summer. With over 40 people to feed multiple meals, the host families (we rotated) went with disposables. Fortunately I hosted a brunch so I could plan food that used reusables and cloth napkins. The thing I couldn't get away from was bottled water because the other hosts have well water which my stomach sometimes reacts too. Fortunately after a couple of days into the reunion we filled every water bottle we had and put them in our own cooler with a reusable ice pack. Problem solved. Oh, and we offered to take all of the bottles back to our home from recycling so I felt a little better.